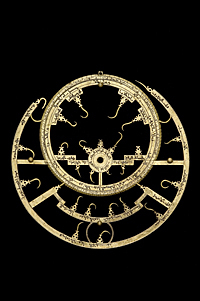 The astrolabe is an instrument used for astronomical and astrological calculations involving the sun and the stars. Islamic instruments are also often equipped for finding the times for daily prayers and with information for determining the direction of Mecca. The standard instrument is based on two ‘planispheric’ projections — of the celestial sphere and of the user’s horizon. By placing and rotating the celestial projection over that based on the local horizon, the user can perform a range of calculations relating to the apparent motions of the sun and the stars. The time, for example, depends on these apparent motions.